Air travel is completely unsustainable (in terms of environmental impact and oil use) and Camden Friends of the Earth has worked closely with local Greenpeace, WDM and other FOE groups to campaign against plans for a third runway at Heathrow. Members of the group posed tough questions at meetings with former Secretary of State for Transport, Ruth Kelly and Secretary of State for the Environment, Hilary Benn. 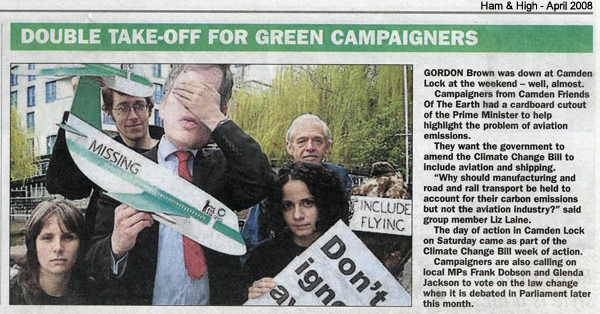 We were therefore delighted when in May 2010 the Government announced they would scrap plans for the 3rd runway. We held a public meeting on Why Noise Matters in November 2011 with John Stewart, Heathrow campaigner and author of ‘Why Noise Matters: A Worldwide Perspective on the Problems, Policies and Solutions‘. • Aviation is the fastest growing cause of climate change. • Despite myths propagated by the airline industry, aviation already accounts for 13% of the UK’s contribution to climate change, according to the Department of Transport. • To make matters worse, aviation is the UK’s fastest-growing source of greenhouse-gas emissions. • We could close every factory, lock away every car and turn off every light in the country, but it won’t halt global warming if we carry on taking planes as often as we do. Despite the overwhelming amount of scientific evidence highlighting the threat from aviation, the sector is not considered by any binding international treaties such as the Kyoto protocol. Find out more at Plane Stupid and make your own pledge to be free from flying for 12 months at Low Fly Zone. Camping Whether it’s at a festival, climate camp or in the wilds, we’re loving all that oxygen! Sleeper trains don’t miss a day of your holiday!